A below the surface stone or granite sealer is referred to as a penetrating sealer - better known as - "an impregnator". Why? Because they go inside of the stone and impregnate it! A color enhancer does just what its name implies - it enhances the color of your stone. Some even do double duty - they enhance AND they seal your stone. Should you use a color enhancer or a sealer? Here are the main differences between a sealer and a color enhancer. To learn more about sealers & enhancers, click on the individual links. 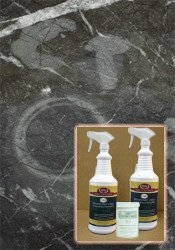 Sealers are designed to prevent staining of your natural stone. Staining occurs when liquids or other substances of a greasy or oily nature are absorbed through the natural pores of the stone. The majority of impregnators are silicon based. Unfortunately, they're the first impregnator type to lose their effectiveness. That's why different manufacturers urge you to reseal often, sometimes as often as once a year. Some sealers are designed for long term use - you seal every ten years! 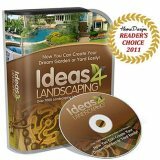 They cost more money up front but save you time & money in the long run! 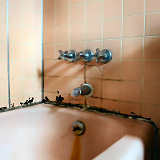 Quite often, stains are confused for surface damage and vice versa. What's The Difference? A True Stain Is Always Darker Than The Stained Material. If it appears as being of a lighter color, it is not a stain but either a mark of corrosion (etching) made by an acid or a caustic mark (bleaching). In other words, a lighter colored "stain" is in fact always surface damage and has no relation whatsoever with the absorbency rate of the damaged material or stone. There Is Not A Single Exception To This Rule! 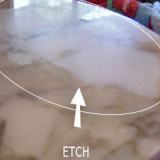 To repair etches, use a marble polishing powder. A true stain is a discoloration of the stone produced by a staining agent that was actually absorbed by the stone. To remove stains, use a poultice. 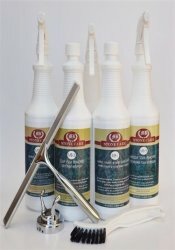 we have a safe natural stone sealer. Sealer - A LONG LASTING stone sealer. Color Enhancer - Get the Wet Look.